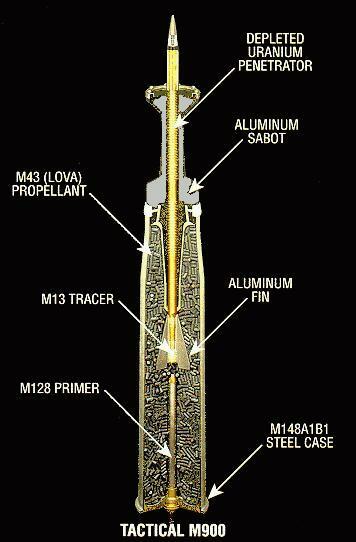 The M900 Depleted Uranium APFSDS-T [Armor Piercing Fin Stabilized Discarding Sabot - Tracer] cartridge is the primary anti-armor 105mm tank ammunition in service with the United States Army and Marine Corps. This fourth-generation kinetic energy projectile is capable of penetrating the frontal slope of fielded adversary armor systems. The penetrator and sabot design provides excellent accuracy at all combat ranges. This cartridge is compatible with the US M-1, M-60, and M-48 series tanks emplying the 105mm M-68 cannon. The electrically initiated primer ignites the propelling charge and tracer. Gases produced by the burning propellant propel the projectile from the gun. The tracer burns for a minimum of 2.5 seconds. The sabot is discarded after leaving the muzzle of the weapon, as a result of setback, centrifugal, and air pressure forces. The solid core of the projectile continues to the target.